Beside standard posts and pages, AWSM theme provides two additional post types: Career and Portfolio. Career post is made so you can easily present your career highlights. 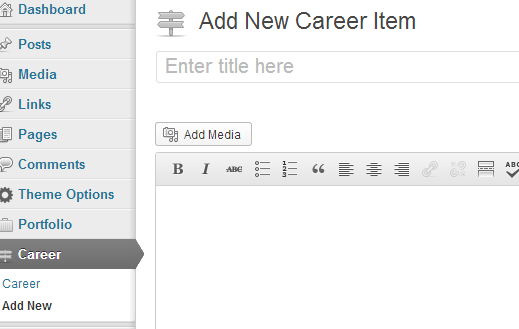 To create a new career item, click on the Career -> Add New admin page. Subtitle Here you can point out some important note. Content Here you can put all description about the item (as for standard WordPress post). External URL This is a place for adding a link to the company you have worked for, or a project website, or any other URL. Icon You can add timeline icon which fits in your specific career story. Featured Image If you want to show the image for your career story, this is a place. Video Here’s the option to add featured video to your career item. It can be YouTube or Vimeo. Featured Media Options This is where you can choose what to show on career page as the featured media for this item. Published Date This will affect display order of your career items on the timeline. Portfolio posts are made so you can easily present your work and projects. 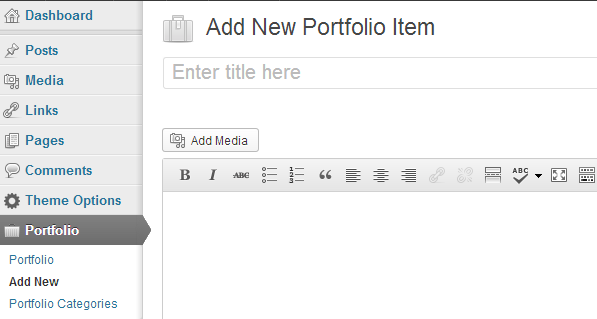 To create a new portfolio item, click on the Portfolio -> Add New admin page. This theme provides main portfolio page which we will describe later in the Page Templates section of this documentation. Content Here you can put all description and content (as for standard WordPress post). Description Here you can point out some important note about it, shortened version of the content to display on main portfolio page. External URL This is a place for adding a portfolio demo website or any other link. Featured Image This is a featured image for your portfolio item. Video Here’s the option to add featured video to your portfolio. It can be YouTube or Vimeo. Featured Media Options This is where you can choose what to show on the portfolio single page as the featured media, as well as in the pop-up of this item on main portfolio template. There are three options, featured image, video or gallery. If you want to show the gallery, you need to create a gallery and attach it to the current portfolio item. Order Use this field to order portfolio items on main portfolio page. Items with highest number will display first. Portfolio Categories You can use portfolio categories if you want to group and filter portfolio items by categories (on the main portfolio page).